The new BMW i8 models are certainly a sight to behold with their combination of sleek design and powerful performance. 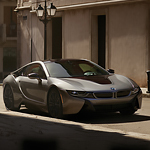 The innovation and attention to detail make the BMW i8 models the premier cars for anyone who loves being on the road. One of the first things that drivers will love about the BMW i8 Roadster or Coupe is the TwinPower Turbo gas engine. It offers 369 horsepower and 420 lb-ft of torque. This is exactly where the power source and exhilarating feeling that drivers get behind the wheel come from. Both the i8 Roadster and Coupe models are plug-in hybrid vehicles that will hold a charge after just three hours of being plugged into a charging station. Save money at the pump and drive with confidence thanks to the 44,000 charging stations available. A test drive at Rick Hill BMW is the best way to experience these features for yourself.